The earliest scissors in China dates to the Western Han dynasty, and this makes it comparable in time period to the earliest Roman scissors. However, the two civilizations developed differing ways to maximize the durability of the tool based on the technology they had available. The breakdown of ancient Chinese scissors can be broken into two types. I will refer to the earlier type as the alpha-shaped scissor, after the greek letter for alpha &#945;. The other type popped into existence by the Eastern Han, which I term as the 8-shaped scissor (based on the numeral 8). Roman scissors are shaped differently, the earliest being U shaped scissors (after the letter U). Later, these scissors evolved into pinched C-shaped scissors. I will explain the reason for these different shapes based on Finite Element Modeling conducted by Lehigh University. Scissor 1 is found in Guanzhou at the Taojin pit, dating to the early Western Han dynasty. Scissor 2 was found in Shannxi, also dated to the early Western Han. 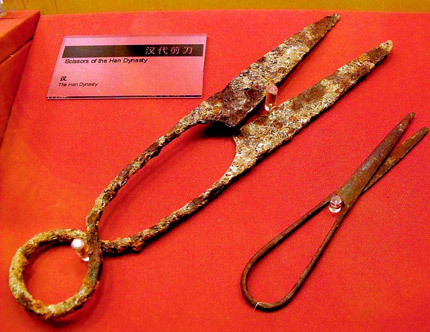 Scissor 3 was found in the ancient city of Yanggao, dating to the mid-late Western Han period. Scissor 4 was unearthed in Henan GongYiShi Xinhua district, dating to the Eastern Han. Scissor 5 was unearthed in Shanxi Xia Xian Wang village, dating to late Eastern Han. Everything after that dates to the post-Han period, from Eastern Jin (317-420 AD) to the Tang dynasty. Why the inward-curve shaped design? The scissor's spring (ie the handle) undergo high amounts of stress during closure, which increases the chance for the scissor to crack when in use. Finite Element Modeling shows that an inward curve-shaped design allows the stress to be converted from tensile stress into compressive stress, and that the maximum stress is now located at the inside of the bend. Compressive stresses allows better resistance against crack propagation, meaning these scissors were less likely to break. The only Han scissor that underwent metallographic testing was one among a group of medium-carbon steel scissor unearthed at Zhengzhou, Dongshima. The scissor was found to be slag free, which suggests that it was made using a blast furnace. Slag in this context is the impurities found in metal objects (mostly due to the leftover non-iron ore that wasn't successfully separated from the iron). Iron with slag impurities creates weak points along the metal. Because the Han scissor is slag free, it provides a cleaner metal that has a smaller chance for the material to fail. Such a slag-free metal wasn't even found in post-Han scissors of the same study. Unlike ancient Chinese scissors, Roman scissors are U-shaped. Finite Element Modeling shows that for this shape most of the stress is going to be located on the outside of the scissor as tensile stress. This increases the chance of breakage. Combined with the slag impurities found in Roman steel blades, the chance of breakage increases even further. To solve this problem, Roman scissors were made with a steel blade, but everything else was made of softer wrought iron. This means that Roman scissors were bi-metallic. The softer wrought iron of the handle would be harder to crack under stress even with slag impurities, while the more brittle steel blade allowed the scissor to retain a sharp cutting edge. Later on, U-shaped scissors made way for C-shaped scissors. It is suspected that C-shaped scissors allowed a decrease in the loading on the spring, although finite element analysis has not yet been conducted. C-shaped scissor design survived into the Viking and Medieval periods. The Roman U shaped design scissor is still being used for manual sheep shears, and you can still order Roman style U-shaped scissors. So any alleged potential cracking issue was not have been a big problem in actual use. The Roman scissors were a simpler shape than the Chinese figure 8 design, and most likely would have been easier to manufacturing than the more complex Chinese figure 8. Certainly less twisting would be required. While examples of Roman scissors can be commonly be found in Roman art, in portrayals of the goddess Atropos, one of the 3 Fates, depiction of ancient Chinese scissors are rare, possibly indicating a scissors were rarer in China than in the Roman world. Here is an example of a Roman bronze pivoted cosmetic scissor. Had the design of the Roman U-shaped scissor been a problem, they could have adopted modern pivoted design scissor. The Roman U shaped design scissor is still being used for manual sheep shears, and you can still order Roman style U-shaped scissors. So any alleged potential cracking issue was not a problem in actual use. The two Roman shears studied in this research were three or a tow pieces. In the three piece shear, the blades were both attached to a separate spring with rivets. In the two piece shear, one blade was forged to a spring and the other blade was riveted. Mechanical bonds are prone to loosening, causing the blades to wobble. This would dramatically decrease the efficiency of the shear. The Viking and the Medieval shears were all single piece shears formed with metallurgical bonds. We also know of single piece Roman shears, although none were examined here. Roman shears from the Petrie collection show evidence of early lap welding (Petrie 1917). Metallurgical bonds have the advantage of remaining stiff. Single piece objects are harder to manufacture, but also represent advancement in conceptual design and improvement in technology. I don't know why you state you can't find sources on ancient Chinese scissors in the "Roman inventions" thread, in an attempt to make it seem as if the Han dynasty don't have scissors, when here you prove that you clearly can find a source about it. And it's in the first post of this thread too. Clearly there's a difference in incentive. While examples of Roman scissors can be commonly be found in Roman art, in portrayals of the goddess Atropos, one of the 3 Fates, depiction of ancient Chinese scissors are rare, indicating a potential scarcity. Why do you want depictions when we already have the original ancient scissors themselves? What is your point? So it's a wikpedia picture by Tom Oates. Please use the same standard you apply to me as you do to yourself. How are we supposed to know if this is a modern depiction or not, considering that every unearthed Greco-Roman scissor that can be confirmed as legit are NOT pivoted with finger holes? Please provide more information on this bas relief to guarantee its authenticity. No description, nothing. A random guy on the internet trying to sell a scissor that he claims to be "Roman" (could be Byzantine Roman or just "Roman style" rather than authentically ancient for all we know), that you consider a reliable source? When I show objects displayed in a museum you made no small amount of effort to imply that it was a forgery, without being able to attack the object itself but merely claimed that OTHER objects in ANOTHER museum was a forgery so this one must be too. Yet here you are willing to believe a random guy on the internet who's willing to sell a Roman scissor for 100 Euros. Uh-huh. The earliest scissors were found in Mesopotamia - a couple of millennia before Han or Rome. There are Egyptian examples as well - dating a little later in the Bronze Age. I think this the Mesopotamian example but can't confirm it atm. I don't know how it got spread on the web that it's one of the earliest scissors when it is clearly not. And even here I doubt its authenticity as it's purchased from some random guy. This just calls for me re-emphasizing the need to not rely on google search images that gives no information about it whatsoever. Got it. Thanks for the correction. By failing to include the fact that the article acknowledge that Roman scissors were harder and sharper, and reporting only the fact that the Chinese scissor design was less prone to cracking, it gives distorted picture. (I apologize for my previous wording). The Viking and the Medieval shears were all single piece shears formed with metallurgical bonds. We also know of single piece Roman shears, although none were examined here. This raises questions of the validity of the entire research, since it wasn't an apples to apples comparison. The 2 and 3 piece scissors would have been made of lower quality but cheaper metal, since they couldn't be made of a single piece. The ability to use lower quality and hence cheaper metal would have offset the cost having separate pieces. A more accurate comparison would have been to compare the metallurgy of a one piece Roman scissor with a Chinese scissor. The very nature of the study was bound to give biased results. It took you a week, despite multiple post by you on the subject, and multiple request by me, to provide the sources. In that week's time, here is the only thing you posted, just a picture that nowhere states that it is in fact a Han dynasty picture. It was as easy to find the information you would have posted it long before. No statement of where the picture came from. nothing but insults, but typical of you. I was honest enough to tell you where I got my picture from, which is more than I can say for you. You just provided a picture, with no indication of where it came from, or even a direct statement it was a Han dynasty scissor. But you are right, it needed better sourcing, and I should have found better pictures. I am apologize for my inappropriate comments. Typical dishonest. By failing to include the fact that the article acknowledge that Roman scissors were harder and sharper, and reporting only the fact that the Chinese scissor design was less prone to cracking, you gave the deliberately dishonest impression. Don't lie, and saying you were just trying to report the facts, by not reporting all the facts, you were being dishonest. The article about harder/sharper Roman scissors is a source provided by YOU, not me. You were the one who found it, even though previously you were implying Han dynasty scissors couldn't exist because you couldn't find any source about Han scissors. Am I suppose to be omniscient and know every source in existence? Just because I didn't use some source you wanted me to use does not make me a liar. Let's not forget that when you were trying to imply that the Han dynasty didn't have scissors, you couldn't find this source either! Only when it suited you did you manage to find it merely three hours after I made this thread, so you got no call to be calling me dishonest. Besides, my own source said that the Han scissor in question was found to have high carbon content, whereas the Roman blade were far from perfect. Unless there is a Vicker's Hardiness comparison I don't see anything's definite. Whereas the source you provided also speculated that the difference in Han/Roman design was due to the better quality of the Han metal. You left that part out, yet where did I call you a liar? Also, if you didn't notice, I didn't start this thread saying Roman scissors was inferior, I said they used a different way to solve the same problem. The superior/inferior competition was something YOU started, I tried to refrain from it even though my source (and even your source) seem to imply that the authors preferred Han scissors as having the better design. I only got sucked into your competition because you are arguing in favor of something that your own source implied otherwise. Your own source said "The Chinese design may be based on the superior quality of iron being used for production", which you left out. So if I left out some source saying Roman scissors were supposedly sharper, in a thread that is focusing on addressing durability, not sharpness, then how does that make me "dishonest"? This raises questions of the validity of the entire research, since it wasn't an apples to apples comparison. The 2 and 3 piece scissors would have been made of lower quality but cheaper metal, since they couldn't be made of a single piece. The ability to use lower quality and hence cheaper metal would have offset the cost having separate pieces. Really? By that logic matchlock muskets and flintlock muskets aren't an apples to apples comparison either. Why can't they compare the disadvantages in design? If they are the same then they wouldn't have advantages and disadvantages. A more accurate comparison would have been to compare the metallurgy of a one piece Roman scissor with a Chinese scissor. The very nature of the study was bound to give biased results. Why is comparing multiple piece Roman scissors to one piece Chinese scissors biased? Romans had multiple piece scissors, did they not? Chinese had one piece scissors, did they not? I made it very clear from the beginning that all you had to do was promise to refrain from treating the source with racism as was typical of your debating tactics whenever you get backed into a corner. You didn't make that promise for a week (and you still haven't), so for a week I didn't provide the source. You could have gotten it much sooner if you simply made that promise. Such a promise doesn't cost people anything because most people don't plan on being racist in the first place. Instead of making such a promise, you just raged at me for not providing the source, and threatened about how I don't have the evidence, even though each time I explained to you that all you needed to do was promise to not be racist. So you got no call to complain. The word for a known liar, that accused me of being someone else from a completely different site, and couldn't even apologize for it, isn't worth very much. How and where did I lie? Show the exact post and where I said anything contradictory to it. You have a tendency to call people liars yet these accusations tend to simply be stuffing words into other people's mouths. After the millionth time when your accusation of dishonesty is proven false, you should have learned by now that maybe next time you accuse me of dishonesty, it's just another one of those things in which you either misread or demand unreasonable standards. So I suppose the list of scissors I made that shows where they are unearthed, you decide to ignore all of them and instead focus on that one picture that I made as an offhand comment. That's incredibly picky of you. So it's a wikpedia picture by Tom Oates. Please use the same standard you apply to me as you do to yourself. I was honest enough to tell you where I got my picture from, which is more than I can say for you. On, so I suppose all the OTHER descriptions I showed, with mention about where I got the picture from and where each scissor was unearthed.... you missed AAALLLL of that and decide to focus on one picture that was shown as an offhand comment? And I didn't accuse you of dishonesty. I accused you of having ridiculously low standards. My accusation has to do with standards of evidence, not honesty, so I don't know why you are bring honesty into it. That first picture I provided you was because you said that you couldn't find a picture of a Han dynasty scissor. So I gave you a picture. We weren't debating during that time. How is that an insult? How does that make me a liar? You just provided a picture, with no indication of where it came from, or even a direct statement it was a Han dynasty scissor. The picture (which I showed as an offenhand comment) shows a sign beside the scissor saying it is a Han dynasty scissor. Must I describe every little thing or can't you just read what the picture says? Read the stupid sign, it says "Scissors of the Han Dynasty". Even if the sign isn't there, how the hell is that supposed to make me a liar? It's just a picture shown as an offhand comment, I don't know why you are making this so personal. Can you be just a tad bit more reasonable? The scissors I showed that weren't offhand comments, I provided with more detail as shown in this thread. Yet you choose to focus on this one particular picture. Bart: You didn't provide where the scissor was unearthed and which period it was dated to! Bart: You don't have the evidence do you! I knew it! Bart: You have been given plenty of time to provide the source, why haven't you? Bart: It took you so long to provide the source, what's wrong with you? Knock it off with the accusations of dishonesty and don't call other members liars.